Pete Budd is "Somerset Born And Proud", as his song lyrics proclaim - born in Brislington, and brought up in nearby Keynsham. His father was an engineer and had no time for a son with ambitions to be a musician, so after he left school, Pete got a job at the big local employer - Fry's Chocolate Factory in Keynsham (now owned by Cadbury's). But it was the Fifties, and rock'n'roll had even reached Keynsham. Pete was a Teddy Boy, a rocker - and played electric guitar in a number of local bands. In the early 1960s he joined Les Watts And The Rebels as the band's guitarist and backing singer. Pete was subsequently voted West Country's No 1 guitarist in a 'Western Scene' poll and eventually took over as the band's frontman (renamed Pete Budd and the Rebels) when Les quit the band. The Rebels also included a young Micky John Bull who went on to form The Best Of British, a comedy showband that supported The Wurzels in the mid-1970s. Pete also made a few records in the 1960s in a band called The Rainbow People. This was a six-piece outfit with two female singers fronting; and they were resident band at the Glen (Locarno) Ballroom. Pete had known Adge Cutler for a long time; both performing on the same local circuit. In 1974, he was asked to take over following the departure of Reg Quantrill. The story then goes that when Reg left, there was a frantic search was made for Pete. He is an keen angler and was, naturally, found after many hours of searching across the Somerset Levels, sitting fishing on a riverbank. Pete did not, apparently, need much persuading - and less than two and a half hours after he had been found with his rod, he was on stage with Adge & The Wurzels filling the gap left by the departed Reg. It was a big gap to fill too, not least because Pete was half the size of Reg, and at those first gigs Pete had to wear Reg's old Wurzels clothes! And there was also the small matter of playing the banjo - Pete was a guitar player, and had never played a banjo in his life. Such trivialities never bothered Adge though, and Pete had to learn on the fly. 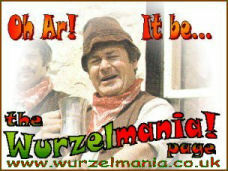 As with all new Wurzels, Pete was given a nickname, and so it was Pete "Rose" Budd from then on! But Pete was suddenly thrown into the limelight. With Adge's death later that year, it was Pete who took over on lead vocals. His is the distinctive lead vocal on all of The Wurzels 1970s chart hits, including their number one smash Combine Harvester and the follow-up hits I Am A Cider Drinker and Farmer Bill's Cowman. His distinctive Somerset voice was also chosen by Ambrosia for the TV commercials to promote their Creamed Rice (Devon knows 'ow they makes it so creamy!). Pete is still the frontman with the band today, and is therefore the second longest serving current Wurzel after Tommy Banner. At the time Pete lived in a small village of Bitton, on the old Bristol-Bath road, with his wife Chris and daughter Julie; and for a while he ran a Water Leisure Centre near Keynsham selling fishing equipment! During the 1980s, Pete and Chris emigrated to Devon. The official line was that he did it to run the Seven Stars pub; but we suspect that it was a good excuse to spend more time fishing. As John Miles said on the Combine Harvester LP sleeve notes, Pete "spends ten per cent of his spare time catching fish and the other ninety per cent eating them. Not very Rock 'n' Roll - but very Scrumpy & Western! He recently moved back to Somerset.